We’d love your help. Let us know what’s wrong with this preview of Cold Shadows by J.L. Bryan. Footsteps in the attic. Toys that play by themselves. A dark presence in an upstairs room. Paranormal investigator Ellie Jordan faces a difficult new case. Her new clients are a family haunted by multiple ghosts and a poltergeist that wrecks their home at night. Their seven-year-old son’s invisible friends may not be imaginary at all, but the restless spirits of dead child Footsteps in the attic. Toys that play by themselves. A dark presence in an upstairs room. Paranormal investigator Ellie Jordan faces a difficult new case. Her new clients are a family haunted by multiple ghosts and a poltergeist that wrecks their home at night. Their seven-year-old son’s invisible friends may not be imaginary at all, but the restless spirits of dead children. To clear her clients’ house of the dangerous entities, Ellie must unravel the mysterious deaths of another family who lived in the old mansion more than a hundred and sixty years ago—and she must do it before the ghosts can carry out their malevolent designs on her clients and their children. To ask other readers questions about Cold Shadows, please sign up. Ellie continues with her scary adventures and it is just as good as book one! Love this series so far! Great ghost series! A family is plagued by ghosts and or a poltergeist. But what happens is beyond weird! So good! The narration keeps the suspense up, great job! This was another creepy listen/read with my son.... once again Ellie and Stacey are summoned to a house to catch a ghost.... I think the two of them work very well together, Ellie is a bit of a bad a**while Stacey is more of a bit of a scaredy-cat (this makes me feel a little better about myself).... The backstory of the family doing the haunting of this house, was really well developed... I was completely surprised as to why they were still around haunting the house, plenty of twists and turns... The creep factor was high, counterbalance with some humorous moments from the mother of the family that was being haunted.... it was quite amusing, a ghost would enter the room throw things around and the mother’s reaction would be oh my Stars & Stripes or oh my LandsEnd catalog, really? My reaction would be where is the door??? Anyways it did add some comic relief to some pretty creepy moments, definitely a perfect book for Halloween .... I will be beginning the next book in the series tonight with my son, how can I not encourage his interest in reading??? If it weren't for a couple of annoying things, it would be as good as the first. They are close, though. Another haunted house and harassed family and Ellie and her assistant Stacey are on the job. After reading it I must say that the main twist and explanations are pretty neat and interesting. After reading it. The thing is, it picks up speed in the second half of the story. I don't have many nitpicks, but the ones I do have were a bit distracting at times. How cluttered the house is and the reas If it weren't for a couple of annoying things, it would be as good as the first. They are close, though. I don't have many nitpicks, but the ones I do have were a bit distracting at times. How cluttered the house is and the reason why Gord (husband of the woman who called them) doesn't sleep upstairs is mentioned at least ten or so times, maybe even more. Stacey was cute in the first book, but she didn't grow out of her fangirling over what they do at all. I hope she changes since she isn't a bad character. Anton Clay, the ghost who killed Ellie's parents, is mentioned and that is one of the most interesting moments in the book. I can't wait for that story. After a surprise love of the first book in the series, I didn't hesitate to pick up the second. And oh boy was this quite the read. Creepier, darker, and full of delicious paranormal woo hoo. Ellie once again manages to get herself in way over her head when it comes to the dark and creepy spirits that haunt the homes of those she visits and while this trait isn't a great one, it somehow works for the storyline. With darkness abound, danger around every creak and glowing orb, this was a fun seque After a surprise love of the first book in the series, I didn't hesitate to pick up the second. And oh boy was this quite the read. Creepier, darker, and full of delicious paranormal woo hoo. With darkness abound, danger around every creak and glowing orb, this was a fun sequel that lived up to the first and then some. Packed full of ghosts, mystery, and a slight hint of a romance to be, this truly was a hard one to put down and makes me excited to see what else Ellie and her friends can get up to in the next installment. Cold Shadows was another good read. I really liked Ellie and Stacey in this one, and i liked seeing Jacob again too. At first, i didn't think there was as many creepy moments as there was in book one, but the second half had loads of them. When the mystery of the family who was haunting the house was revealed, i was quite surprised. I didn't expect their story to end that way. It's been almost two years since I read the first book in this series. I liked it a lot, but for some reason I didn't find myself wanting to return to Ellie's world right away. I did finally decide to pick this one up though, and it was enjoyable. I love ghost stories and this one had its creepy moments, but there is just something lacking in this series for me. I think the main thing is that there is nex Footsteps in the attic. Toys that play by themselves. A dark presence in an upstairs room. It's been almost two years since I read the first book in this series. I liked it a lot, but for some reason I didn't find myself wanting to return to Ellie's world right away. I did finally decide to pick this one up though, and it was enjoyable. I love ghost stories and this one had its creepy moments, but there is just something lacking in this series for me. I think the main thing is that there is next to no story besides the job they are on. I would very much like to see more character development and more story away from the job. Who are these characters besides ghost hunters? We have been told some background on Ellie, but I need to see more. I've read a few reviews for the third book in the series and it seems like that may be coming. I'm enjoying this series, and even though I don't think it's spectacular, it has potential so I'm willing to give it at least one more try. Plot: This is about Ellie who is a paranormal investigator/ghost trapper. She reviews the cases and finds the ones that are truly real. I really enjoyed reading about Ellie. I think she is strong and passio I’ve decided to pick back up this series and continue it. I read the first book and got hooked. Ever since, I wondered what new adventures awaited Ellie. Also, please note that due to pregnancy insomnia, I started this book late at night and could not stop reading it. Plus, I got a bit scared. Four Stars: Another exciting and scary ghost adventure. Ellie and Stacey pull up to the old, dark mansion which appear to have a pond in the front yard. Stacey jokes that the pond is likely where the bodies will be hidden. Ellie and Stacey are on another ghost hunting adventure. Once they enter the house built back in 1841, they encounter several terrifying ghosts. It is up to Stacey and Ellie to find out who is behind the hauntings and eradicate them, but the truth ends up being more terrifying Four Stars: Another exciting and scary ghost adventure. Ellie and Stacey pull up to the old, dark mansion which appear to have a pond in the front yard. Stacey jokes that the pond is likely where the bodies will be hidden. Ellie and Stacey are on another ghost hunting adventure. Once they enter the house built back in 1841, they encounter several terrifying ghosts. It is up to Stacey and Ellie to find out who is behind the hauntings and eradicate them, but the truth ends up being more terrifying than either of them anticipated. Can Ellie and Stacey trap the ghosts? *I was pleased that I didn't have lengthy wait for this sequel, and I am happy to say that Mr. Bryan delivered with this second book. If you like scary, suspenseful ghost stories, this is a must read series. Once again, I was fascinated by the ghost hunting. I appreciate that Mr. Bryan makes this as authentic as possible. I love the ghost hunting gadgets and gizmos, and I like learning more about how ghost hunters go about their business. If you are a fan of ghost hunting shows and such, this is a series you must read. *I enjoyed the sinister history of the house and the family that once resided there. I especially liked that the history wasn't all laid out for Stacey and Ellie, and that they had to dig for the sordid truth. Learning the truth about the haunting was creepy and unsettling. *This book is a fast and furious read. It focuses solely on the haunting and the trapping of the ghosts. There isn't much time spent on anything else. Think of it as a ghost hunting case file. If you haven't read the first book, you could easily jump in and read this one without missing much. I liked that it was a quick, fast read that stayed focused on the haunting. *Jacob the psychic returns, and I was eager to see him in action. I am fascinated by those who claim to see and converse with ghosts. I am hoping he will continue to have larger roles in the subsequent books. *If you are looking for scary and creepy as far as ghosts, this is the book for you. I love that has a realistic feel. The finale is an adrenaline thrill ride not for those who scare easily. *I liked that the book wraps up all the loose ends regarding the main story line, while leaving a new dangling thread for the next book which will be released February 2015. Yeah! *Even though I liked that this book was solely focused on the haunting, it didn't allow for any more character development. I was hoping to learn a bit more about Ellie, but that doesn't happen. Jacob is in and out of the picture, and I didn't get any more information on him, either. I am hopeful that the next book will be longer and allow for exploration of the main characters. *I struggled a bit with the family that lived in the house. You would think they would have been heading for the hills after their children's lives were put into danger, but they don't. I didn't buy that. *The book was too short. It is more like a novella than a novel, and I wanted more! Still you can read this in one sitting as it is fast and furious. Cold Shadows is an exciting and chilling sequel. I thought this second haunting was scarier and more interesting than the first. If you love realistic ghost stories this is a must read series. I am loving it so far and eager to see what Mr. Bryan will cook up next. I’m honestly surprised! I definitely like the first book, but I wasn’t really creeped out or anything. I feel like the writing must’ve improved somehow cause there were scenes in this book that made me take a few glimpses at the dark corners of my room 😹 I truly enjoyed the spooky parts. The story behind the haunting, even though not perfectly explained, really caught my attention and I was working on my theories alongside Ellie. Unlike the first book there wasnt a single moment were I got bored I’m honestly surprised! I definitely like the first book, but I wasn’t really creeped out or anything. I feel like the writing must’ve improved somehow cause there were scenes in this book that made me take a few glimpses at the dark corners of my room 😹 I truly enjoyed the spooky parts. The story behind the haunting, even though not perfectly explained, really caught my attention and I was working on my theories alongside Ellie. Unlike the first book there wasnt a single moment were I got bored or distracted in this one. The story flows in an incredible pace that keeps you hooked. Ellie, although not a perfect character, (yes, i'm looking at you, Kate) is becoming one of my fav leads. She doesn’t have anything particularly special about her, still there's something about her that makes impossible for me to dislike her. Does that even makes sense? Anyway, I know romance isn’t necessarily part of this series, but I was kinda thinking that something would eventually happen between Ellie and Jordan. I guess I was wrong, but I'm definitely not upset at how things turned out. To be completely honest they don’t really seem to fit. 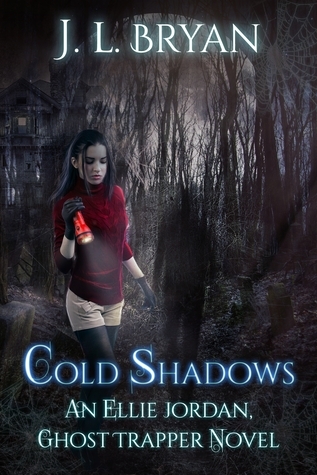 Cold Shadows is a great follow up to the first Ellie Jordan book. J.L. Bryan has created an interesting team in Ellie and Stacey Rae. Calvin and Jacob (and Grant) are solid peripheral characters (though I'm really hoping the romance thread doesn't continue too strongly in later books). Seriously, if the romance thing heads the way its already looking, I'll stop reading the series. Ergh. Anyways, the interaction and relationships between all the characters are believable and mostly enjoyable. 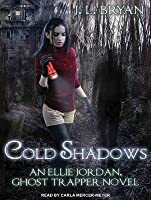 I'd Cold Shadows is a great follow up to the first Ellie Jordan book. J.L. Bryan has created an interesting team in Ellie and Stacey Rae. Calvin and Jacob (and Grant) are solid peripheral characters (though I'm really hoping the romance thread doesn't continue too strongly in later books). Seriously, if the romance thing heads the way its already looking, I'll stop reading the series. Ergh. Anyways, the interaction and relationships between all the characters are believable and mostly enjoyable. I'd love to see a flashback bit dealing with Calvin and Ellie's initial team-up. The situation that Ellie and Stacey face in Cold Shadows was, again, not your typical ghost story set up. J.L. Bryan is good at putting unexpected twists on set-ups that look fairly straight forward. There was definitely a scene in here that made me sit up a bit straighter and go "What the ??" He kept everything moving along at a decent pace with plenty of action. The otherworldly presences have a few appearances that will definitely spook a gleeful scaredy-cat reader. The Paulding House was described just enough that you got a sense of the layout without having a clear cut picture of everything in your head. I think this actually works to make it creepier, because you can see it happening in a house you know easier. I’m thoroughly enjoying this series! I was impressed with the first book, and Cold Shadows has me completely hooked. This is a quick read without feeling rushed, and it certainly isn’t slacking in quality. Ghosts can be total dicks. That’s what I’ve learned from this book. Especially when it involves children. I love that it doesn’t feel … cartoony. Does that make sense? It feels realistic, and that actually plays a huge factor in the creepiness. Enjoyable enough. It'd been quite a long time since I read book one in this series. I honestly didn't remember much beyond the bare bones. But I was able to pick this one up without trouble. It suffers from a bit of the "we did this" and then "we did this" writing, Ellie seems to take beating after beating without effect, and honestly I couldn't figure out how the homeowner kept sleeping through all the racket she and the ghosts must have been making. But it was a fun little ghost mystery. I 100 Enjoyable enough. It'd been quite a long time since I read book one in this series. I honestly didn't remember much beyond the bare bones. But I was able to pick this one up without trouble. It suffers from a bit of the "we did this" and then "we did this" writing, Ellie seems to take beating after beating without effect, and honestly I couldn't figure out how the homeowner kept sleeping through all the racket she and the ghosts must have been making. But it was a fun little ghost mystery. I 100% approve of seeing a paraplegic, wheelchair using business owner. He may not play a big part in the book, page-wise, but he is an important character. (I'm sure he was in book one too, but as I'd forgotten, it got to be a new surprise again.) Similarly, there are characters who are "plump," but no issue is made of it. I quite liked this second entry in the Ellie Jordan, Ghost Trapper series. This time out, Ellie and Stacey are hired to remove multiple ghosts from a house. A family with two children currently lives in the house, and the children (a young boy and an adolescent girl) are being terrorized by the ghosts. I thought the mystery of the ghosts -- and eventually a poltergeist -- was intriguing. As with the first, this book is primarily plot-driven, with minimal character development. However, at the en I quite liked this second entry in the Ellie Jordan, Ghost Trapper series. This time out, Ellie and Stacey are hired to remove multiple ghosts from a house. A family with two children currently lives in the house, and the children (a young boy and an adolescent girl) are being terrorized by the ghosts. I thought the mystery of the ghosts -- and eventually a poltergeist -- was intriguing. As with the first, this book is primarily plot-driven, with minimal character development. However, at the end there's a glimmering that we may learn a bit more about Ellie, and that she may start to develop something of a personal life.....at least I hope she does. I'd give this a B, so four stars here. I'll definitely pick up the third in the series and read it at some point in the near future. It’s time for Ellie to get back to ghost trapping. She’s got a nasty new case. Looks like it might be a poltergeist. The family is experiencing loud noises, objects getting thrown around, toys playing by themselves. There is a young lady in the house and that’s usually where a poltergeist comes from. All that teen angst. And she’s got a lot of it. But their younger son is experiencing some odd things too. Imaginary friends that are causing him to slowly withdraw from the family. If it’s a poltergei It’s time for Ellie to get back to ghost trapping. She’s got a nasty new case. Looks like it might be a poltergeist. If it’s a poltergeist, it’s like nothing they’ve heard of before. Seems to be more powerful and have its own agenda.Things get more violent, and Ellie comes under attack. It’s time to trap this entity before some gets seriously hurt or dies. Ellie’s new assistant Stacey, is coming along nicely. She may spend most of her time in their van outside, monitoring the cameras, but she’s ready at the drop of a hat to rush in when Ellie gets in trouble. Which she does when she tries to tackle whatever entity is attacking the family. I like Stacey’s sense of humor. She’s always trying to put her own name to occurrences. And she never cuts Ellie any slack about her love life, or lack of. Ellis is getting more confident as she gains experience. She’s a great researcher and not afraid to try a new angle when an entity defies capture. There’s mention again of Ellie’s parents, teasers about how they died and by who or what’s hands. I hope we get that story somewhere in this series. This was another gripping ghost tale and it had a gothic feel to it. I could see the house, scary even in the daylight. Feel the heavy, malevolent atmosphere inside. And I think I was more scared than Ellie when things got really violent. The title for this series may have you thinking of the movie Ghostbusters. You might expect it to be all fun and filled with ecto spewing ghosts. There may be some of that, but these are darker, more developed hauntings, fraught with danger. Watch your step is what I say. If you like ghost stories that make you jump at sudden noises, keep you looking at those shadows that move out of the corner of your eye, and sleep with the light on, I recommend you give this series a read. Keep a torch handy in case the electricity goes out. When I read the first book in the Ellie Jordan Series I was quite enamored and while I would love to tell you that book two was equally as impressive, I just cannot do so. While "Cold Shadows" was an interesting read it spent more time discussing the mechanics of ghost hunting and trapping and less time on the personalities of the characters. Although I enjoyed the ghost trapping Ellie's personal life was like watching paint dry: BORING! The ghost busting team of Ellie and Stacie go out to a old When I read the first book in the Ellie Jordan Series I was quite enamored and while I would love to tell you that book two was equally as impressive, I just cannot do so. While "Cold Shadows" was an interesting read it spent more time discussing the mechanics of ghost hunting and trapping and less time on the personalities of the characters. Although I enjoyed the ghost trapping Ellie's personal life was like watching paint dry: BORING! The ghost busting team of Ellie and Stacie go out to a old home occupied by a family who are struggling to survive the wages of war with the ghost and with the financial burden being forced on them due to the damages cause by the ghost. We have a father, Ford, who now has emphysema since moving into the house and is now unable to work, a mother who.is the bread winner, a teenage girl, Juniper, who is suffering from teen angst because her parents don't like her boyfriend and a younger son, Crane, who has made friends with two ghosts his parents believe are his imaginary friends. When the history of the house is uncovered we find that an abusive father, Isaiah, was murdered by his wife and his two boys, daughter and wife were drowned but by whom and why? As the story unfolds and Ellie thinks she has a handle on how to stop the abusive Isaiah but does she really? This book was much more fast paced than the first and had me on the edge through the whole book. Reading it at night time I even thought I saw shadows moving. I can't wait to buy the next books in series. Cold Shadows is the second book in Ellie Jordan series, and it's taken a week or two for me to get around to reading it. Living in a haunted house has got to be creepy, right. How about living in a house with four ghosts..one of them a possible poltergeist? Well this situation is Ellie and Stacey's next investigation, and it's one that starts off quickly. Cold Shadows was a quicker read than the previous book. I also notice a pattern with the houses....they are all fabulous massive houses, which Cold Shadows is the second book in Ellie Jordan series, and it's taken a week or two for me to get around to reading it. Living in a haunted house has got to be creepy, right. How about living in a house with four ghosts..one of them a possible poltergeist? Well this situation is Ellie and Stacey's next investigation, and it's one that starts off quickly. Cold Shadows was a quicker read than the previous book. I also notice a pattern with the houses....they are all fabulous massive houses, which are my dream house...except I don't think I want the hauntings. Once I began reading Cold Shadows and the hauntings really started they felt more intense and more life threatening, and there was some really creepy goings on, but I loved every page of it. Yes I was nervous, worried whether Ellie, Stacey, or even Jacob would survive the night, but it made Cold Shadows that much more gripping, and I really did not want to put it down. I really liked that we get to see more of Jacob and that he once again is recruited to help solve a case. His skills are an asset that Ellie and Stacey really need, much to Ellie's annoyance. This trio really know how to pack a punch and their teamwork together certainly gets a job done. I have to say that I've enjoyed everything J.L. Bryan has written (hoists the fangirl flag with a rousing cheer) and I'm REALLY digging on this new series. 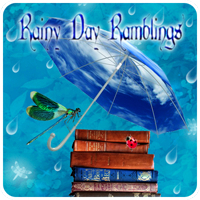 Ghosts, mayhem, quirky characters with intriguing back stories, and DANGER, ELLIE JORDAN! DANGER! One thing I'm enjoying is how the past ties in with the present. Ellie has to piece together what happened long ago to figure out how it ties in with her current case. She's working off historical documents and a goodly dose of intuition (although I have to say that I've enjoyed everything J.L. Bryan has written (hoists the fangirl flag with a rousing cheer) and I'm REALLY digging on this new series. Ghosts, mayhem, quirky characters with intriguing back stories, and DANGER, ELLIE JORDAN! DANGER! One thing I'm enjoying is how the past ties in with the present. Ellie has to piece together what happened long ago to figure out how it ties in with her current case. She's working off historical documents and a goodly dose of intuition (although she'd tell you she follows the facts, but I like the leaps she makes) to figure out who's who and why they're acting as they are. And, yes, she does follow the facts more than she intuits. She treats her ghost hunting as a science, even when she invites the resident psychic into her investigation. I just wonder if her run-in with a malevolent spirit when she was younger makes her more open to seeing connections that others might brush aside. Speaking of the resident psychic, Ellie's love life is sort of a barren wasteland. While I'm not holding my breath that she's going to go for him (that might make things awkward down the line), I am hoping she finds someone who can understand what she does and why she does it. It might be nice to have someone to lean on after getting thrown down a flight of stairs or two during a rough case. Bottom line: I'm loving this series and can't wait to see what crazy ghostly shenanigans Ellie and her crew uncover next. Again, a very scary tale with real ghosts! My two quibbles are (1) I wish the book had been longer than 176 pages, because then (2) along with all of the scary action scenes there would have been space for new character developments. Mr. Bryan is a talented writer, and I'm enjoying the series very much. A little slower pace between hair-raising scenes would be a good thing, however. Looking forward to the next book in the series. I downloaded book 3 as soon as I finished this one... perfect October creepy reads! This is the 2nd book in the ghost trapper series and I definitely like them a lot. In fact I will probably be downloading the other two soon. I like the characters and the ghosts are always a little scary but not so scary I don't sleep for a week! What a fun series! Love these characters and I enjoy their...encounters! This one had me guessing as to the nature of the otherworldly antagonists, and I burned through it in two and a half hours, I couldn't put it down. I might have found a new favorite book series! Another great story in the Ellie Jordan series. I am really enjoying this series so far. Ghosts are my favorite form of paranormal reading. This book has it all for me. J L Bryan has also done her homework on knowing how the paranormal equipment Ellie uses works. Some books about ghosts the writer has very little clue on what the equipment is used for and how it is used. Ellie Jordan is a Ghost Trapper in Savannah Ga. Along with her partner Stacy they go into to haunted homes and relieve the hou Another great story in the Ellie Jordan series. I am really enjoying this series so far. Ghosts are my favorite form of paranormal reading. This book has it all for me. J L Bryan has also done her homework on knowing how the paranormal equipment Ellie uses works. Some books about ghosts the writer has very little clue on what the equipment is used for and how it is used. Ellie Jordan is a Ghost Trapper in Savannah Ga. Along with her partner Stacy they go into to haunted homes and relieve the house of the ghosts. In this book they are trying to rid an old mansion of a family of 5 ghosts and a poltergeist. It get very intense at times, and Ellie must pull out all the stops to trap the ghosts and move them on. The family who now lives in the mansion is basically being tortured by the ghosts and the poltergeist, to the point the 2 boy ghosts are trying to get the 7 year old living boy to join them in death for one. The teenage girl is being tormented by the poltergeist. The father ghost is big bad and mean. I just finished reading this book. It is the second in the series and the second I have read. It was very entertaining and a compelling read. The story starts out with a family being haunted by a dangerous ghost (or ghosts as the case may be). Ellie, Stacy and later Jake are called in to help the besieged family out. I know this sounds rather standard for this sort of story, but the twists that Mr. Bryan provides are interesting enough to keep you reading. Is the story believable? I don't believe I just finished reading this book. It is the second in the series and the second I have read. Is the story believable? I don't believe in ghosts so no, not for me. Is it scary? Well it isn't Lovecraft but it gave me some chills. Would I recommend it to friend? Yes and I have. I read the first Ellie Jordan book about a year ago,and I really enjoyed it but never picked up #2 until recently. It did not disappoint! Another great ghost story with believable, interesting characters!! If you've ever seen a ghost investigation show, you'll recognise a lot of the things Ellie uses in her investigations- I enjoy the realistic touches (you know, instead of her having some specialty equipment that doesn't seem like it should work). I would definitely recommend th So far, so good! I really just love paranormal investigations, but J.L. Bryan really writes the best ones. These first two books in the Ghost Trapper series have stood out for me for their focus on the actual events with solid, exciting descriptions that pull me straight into the situation. I halfway had this one figured out, but was just a bit left of the really amazing ending. And these characters just keep growing and developing. A real joy to read. Cold Shadows was an AWESOME READ!! Ellie and her Audio/Video Tech Stacey, go on assignment at an old house, with complaints of disturbing things going on. Ellie winds up bring in Jacob, their Psychic associate, to have him check the son and daughter of the house. To check out the son and daughter to see of either of them, created a poltiguist and cause the ghosts appear. Heart stopping events occur, while the do their investigation. A MUST READ, if you are into ghostly events!! I must say, reading Cold Shadows was an AWESOME READ!! “What's next?" Stacey glanced down the intersecting hall at the closed door to Juniper's room, from which more harsh, angry music leaked out. Our options were to go talk to the moody teenage girl or go set up in the creepy attic where Toolie had heard strange thumps, crashes, and footsteps.